My vision for my practice: Reducing the unnecessary lack of necessary life needs: touch, relaxation and sincere attention. Why would anyone in the Netherlands – or in the world – have a shortage of this? Well-being is a human right and it should be accessible to everyone. I believe that everyone should have acces to necessary life needs: Touch, Relaxation and Sincere Attention. That is why I have started an Experiment in Generosity by applying Gift Economy in my practice. In a gift economy, goods and services are given without any strings attached; it is an economic system where it is the circulation of the gifts within the community that leads to increase — increase in connections, increase in relationship strength; in this context, hoarding actually decreases wealth. At its core, gift-economy is a shift from consumption to contribution, transaction to trust, scarcity to abundance, and isolation to community and a shift from Me to We. Since 2012 I have run a business on the principle of Pay-What-It’s-Worth-To-You. So I had some experience with Gift Economy. In 2014 I opened my practice for Cuddle Sessions and Massage treatments. Here I introduced fixed prices, but by doing so I felt like I had let go of a part of myself. In December 2017 I went on a study trip to India (Auroville & Pondicherry). It filled my heart with joy to be introduced to Karma Kitchen and Aravind Eye Care Hospital. Both run fully on the philosophy of Gift Economy. This gave me the inspiration to also introduce Gift Economy in my practice. * this amount may be higher or lower than the full amount. The Gift Economy philosophy is also supported by the experts and musicians with whom I collaborate. I am grateful for their warm-hearted commitment and trust. For us there is no fixed income. Everyone receives a percentage of the revenues per event. Would you like to contribute as a sponsor of Lepeltje Lepeltje Knuffelsessies & Massage, and become part of the Gift Economy? Please visit my Sponsor page or sponsor now via the Sponsor Form. This week, particular attention is paid to people who have less perrsonal contact than is desirable to function properly. Various circumtances can cause this situation. If there is no one who puts an arm around your shoulder, listens to you or is just with you… life can be very heavy. This description applies to a large part of my clients, and I think everyone knows these times in life. That is why I offer Touch, Relaxation and Sincere Attention during Individual Sessions and group workshop. I touch people phisically but also emotionally. This way I give them the feeling that they matter, because they certainly do! Anyone can get into a situation where she/ he needs help and support. Unfortunately, it may be difficult for some people to pay for this at those times. That is why I think it’s a nice symbolism to introduce the Gift Economy experiment for Individual Sessions in this week. Queen Maxima opened the national congress against loneliness on 27th September 2018. Imagine a restaurant where you pay-forward for the person after you. How long might the chain of generosity last? Karma Kitchen first opened in Berkeley on March 31st 2007, by several volunteers inspired to seed the value of a “gift economy”. It has now spread around the globe. 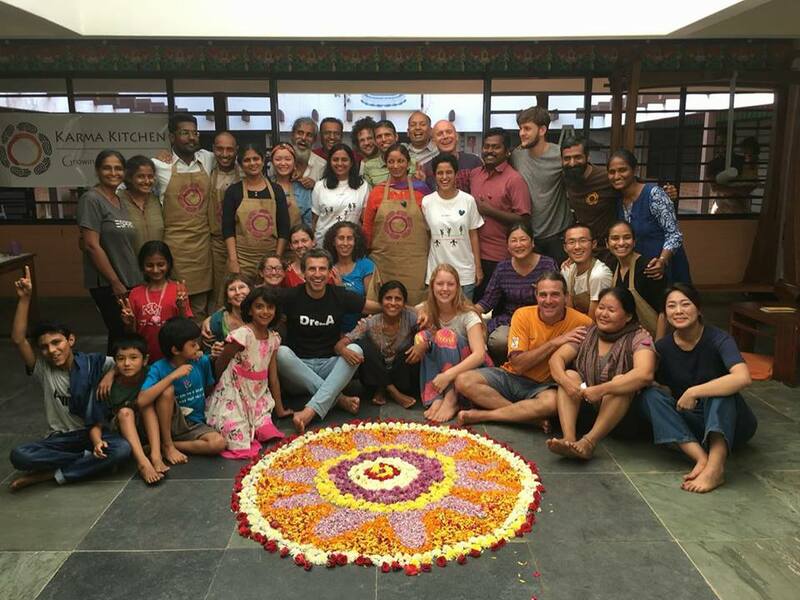 On December 17th, a big group of international and local people joined hands to create a Karma Kitchen in Auroville, India. It was an honour to be part of it. “The food tastes like Love!” “Best meal I’ve ever had!” “The volunteer team was in FLOW!” These are some of the common sentiments after an epic Karma Kitchen experiment in Auroville. Within 2 hours on a sunny Sunday, the team welcomed over 120 guests to co-create the magic of deliciousness and generosity. 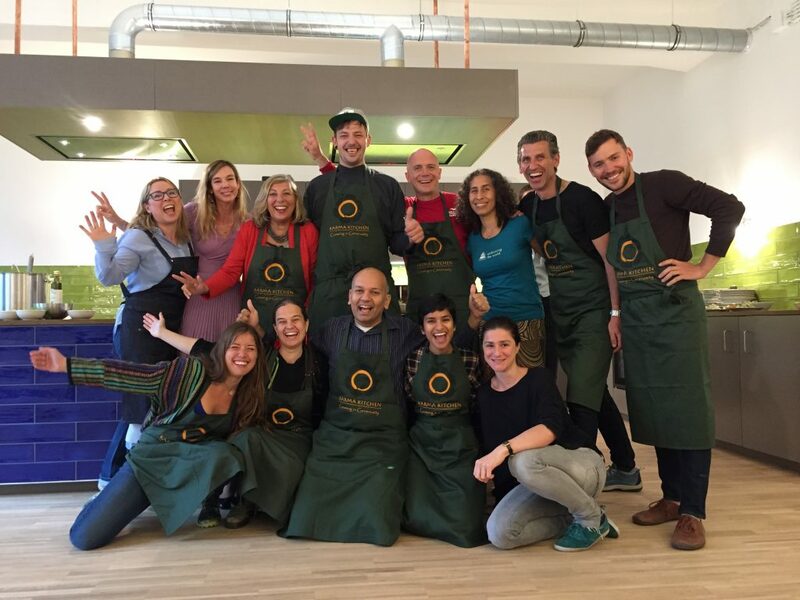 On April 26th, a big community of friends came together to create our first Karma Kitchen in Vienna, Austria! It was a big joy and succes! And in many ways, it was mini reunion of our time at Karma Kitchen in Auroville last December. At the heart of this story of the Aravind Eye Care System is how an impossible dream, one man’s vision of preventing all unnecessary blindness, has become a global system of compassionate care for all. Founded in southern India more than 40 years ago by Dr. V., a true visionary, Aravind is now the largest provider of eye care in the world. Even more remarkable is the fact that people receive care at Aravind eye hospitals whether or not they can pay for it. No one is turned away and all receive the same dignity and high quality of care. Aravind reaches out to rural people who cannot access care in the cities for exams and if necessary transports them to a hospital for surgery. When needed supplies became too costly Aravind set up a manufacturing system to make them at greatly reduced costs. The Aravind system is an inspiring example of self reliance, frugality and equity in the world of increasing health care costs and barriers to care. How does payment work at Aravind Eye Care? When people walk into an Aravind Eye Hospital they have a choise: whether to fully pay for the treatment, pay a different amount or to receive it treatment for free. In this model revenue from each paying patient supports treatment for two free surgeries.